The signs in casinos read: "Bet responsibly. "The commercials and billboards for beer and cocktails proclaim "Drink Responsibly." How about eating? Do any of the advertisements suggest that we "Binge Responsibly?" In keeping the pounds off, is there any such thing as bullshitting responsibly? Fantastic post. I could identify and appreciate having even more insight into my insanity. I don't love the behavior but nor do I hate it. I acknowledge it for what it is...a coping mechanism I developed as a child to numb myself from pain, a behavior that became out of control when I was a young adult, and something I started to understand and recover from in the past seven years. So for me it's not about "getting away with it" or "admitting" it to myself or others...and it's not about "never again." It's about catching myself sooner, accepting myself right where I am, making a decision in the moment and sometimes that decision is to binge. And when I do, there's always a gift in it as my awareness becomes keener and I understand myself that much better. And I think that's pretty darned responsible. I am proud to say that what amounts to a binge today is certainly not what it was 10 years ago. I couldn't binge like that even if I tried. I used to binge years ago, but I haven't indulged in what could be called a "binge" for many years. Nevertheless, I have still gained weight in the past 5 years, because I simply ate more than I burned. I don't kid myself by thinking that I couldn't get back to binging again. I think that if you're a compulsive overeater, obsessive food-related behaviors are lying in wait for an opportunity to come back stronger than before, no matter how many years it's been. For me, working on creating and maintaining a healthy lifestyle is the key. 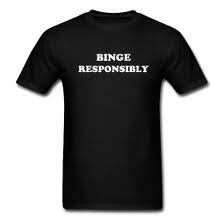 Binge responsibly...I do think for some of us that it is BS. It is never easy for me to stop until the cake is gone or the candy bars have been eaten. I have to acknowledge that I am not a responsible binger and never will be. yep. I have done that. Just recently with dried apricots and before that with cereal. I refused to recognize it with the cereal and my husband had to call me out - I did not eat it again. Then with the apricots I saw it and asked my husband to hide them from me until I could control myself. I seem to be fixated on them right now, so I cannot see them. Sometimes I get an idea of pigging out on something for my birthday. I kept a list (as instructed by one book) and the items piled up. I finally tossed the list. I think it was toxic to do that - at least for me. The accounting of deprivation and concentrating on it versus keeping my eye on what I want for myself and how that happens. You lose focus, bad things happen. Great post! Binge responsibly... hmmmm. Seems like denial sprinkled with a few excuses- LOL!! I love the comparison with the "gamble responsibly" or "drink responsibly". Store owners know addicts will frequent, but hey,if you are responsible, the casino/bar stands to earn more money- as long as you are not too sick or broke to haul yourself in there. Could this be the same message (formula?) that companies use to make foods that are hard to stop at a few- chips, cookies? This is why "in moderation" has never worked for me. Hi, Jane -- I'm the writer whose query you responded to the other day. I'm worried that my e-mail back to you might have landed in your spam trap. If you see this, can you please shoot me a note at colleen at visi dot com? I'd love to talk to you. Thanks! Leslie - Luckily insanity does not have to be terminal. KCL/A. Karen - I like the concept "it is about catching myself sooner." E. Jane - Creating and maintaining go hand and hand. If I cannot maintain I have not created something that works. Alida - I need to find something else to do responsbily, too.